What are the most important challenges facing paid search? 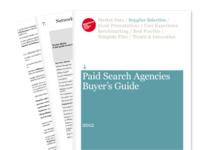 Earlier this year, Econsultancy launched the latest edition of the Paid Search Agencies Buyer’s Guide. As is the case for most buyer’s guides, we invite experts from top agencies within the field to share their knowledge on what is happening within the industry. So much material was contributed for the guide that we couldn’t include all of it. Instead, we are offering some of their insights here on the blog. Last week, a selection of experts discussed the biggest opportunities within paid search. This week, we share answers to the question, “What do you consider to be the most important challenges facing the paid search sector?” Their answers are below. Last-click attribution is still common place, so a key challenge is to gain a better understanding of how each keyword in your search activity contributes to the final conversion. This gives you a true picture of how conversions are being driven, so ensures that you optimise in the most efficient way possible. Understanding the whole value delivered by your search activity, not just direct sales completed online, is also a key challenge. “Soft” conversions such as brochure downloads have an intrinsic value and should be reported as part of the total revenue achieved, helping optimise the activity more effectively. Also, if you are a business that is likely to convert via the phone, then call tracking to monitor the migration from online to offline is also a key consideration. Data – how to collect it and what to do with it. There’s so much information available that it’s easy to suffer from data overload and end up doing nothing with it. To really excel in the space it is vital that data is utilised in the best way for your business to help set you apart from your competition. It’s also going to be a challenge to diversify. For a long time it’s been easy to rely on AdWords to drive significant enough volume to justify ignoring other paid channels. But, with AdWords becoming more and more competitive those in paid search need to explore as many new paid opportunities as possible to both protect themselves and widen their reach. As a starting point, Adcenter, Facebook, Linked In, mobile advertising and remarketing provide plenty of potential for exploration but, finding the time and resources to do so can often be a major challenge in itself. Attribution modelling. It’s a hot topic right now and a challenge that everyone seems to be trying to solve. There has been a lot of theory published around attribution and a lot of charts being produced. However, I have seen very little in the way of actual implemented solutions (attribution models) which have any scientific basis. Once people start to think sensibly about this I think it will lead to a large change in the way PPC accounts are managed on a day-to-day basis. At the moment there are many innovations within the paid search landscape, so one of the greatest challenges is where to prioritise focus. Should you spend more time focused on display based PPC through the likes of Facebook and the Google Display Network? Should you be looking at setting up mobile and tablet optimised accounts? Should you be looking to integrate your website product feeds with your PPC campaigns? The simple answer is you should be doing all of it. Technology, analytics and strong processes are therefore vital in ensuring your PPC activity is delivering the highest possible ROI. The challenge is getting the balance right between innovation and delivery. The seemingly ubiquitous adoption of Google AdWords means that most big-brand marketers have a view on what they believe are the benefits and potential weaknesses of paid search. As a medium, PPC’s current position is somewhat comparable to where TV advertising found itself a decade ago – client enthusiasm is waning, just as the technology is becoming interesting again! The paid search industry, then, needs to take responsibility: marketers must rejuvenate clients’ passion for paid search. PPC should be something you put on your marketing schedule because your heart tells you to, as well as your head. Without doubt, the sheer number of advertisers that are now using paid search poses one of the biggest challenges for this marketing channel. With more companies using platforms such as AdWords, both the cost of achieving top positions and the level of competition have increased. Going back five years, the competition on paid search was far less and this really showed in the average CPCs an advertiser had to pay to secure a good position. Average CPCs are only going to increase as more advertisers begin paid search marketing, so it is more important than ever to start sooner rather than later and build up history and quality within a paid search account. The pace of change and increasing complexity are ongoing challenges. Google’s recent move to increase the maximum number of campaigns with any given AdWords account is telling. Paid campaigns are increasing in complexity every week. You now need to build out separate campaigns for product feeds, dynamic search ads, locations, devices, mobile networks and operating systems to mention just a few. Clients and agencies alike need to keep up with developments while also ensuring that each tactic is used in the most effective manner. Are there any other challenges facing the paid search sector? Have you faced any recent difficulties with your paid search campaigns? How have you adapted to the challenges within paid search? Thanks in large part to the popularity of video on the consumer internet, video has become a more important part of many companies’ B2B content marketing strategies. For obvious reasons, the process of creating an effective B2B video is a bit different than creating a B2C video, but that doesn’t mean that it’s an impossible undertaking. Once again I’ve rounded up some of the most interesting digital marketing stats we’ve seen this week. Stats include the market for PPC bid management technology, social media in the Middle East, the causes of cart abandonment, the ever increasing popularity of search and Samsung’s sales figures. Is real-time bidding (RTB) for video overhyped? The market for real-time bidding (RTB) may be a nascent one, but many experts believe RTB will have a significant impact on the ways marketers buy media and the ecosystem of companies in the space is growing rapidly as evidenced by our new Real Time Bidding (RTB) Buyer’s Guide. Although much of the RTB action has been in the display market thus far, the amount of RTB video inventory available is growing too and is expected to account for nearly a quarter (22%) of online video spend in 2013.